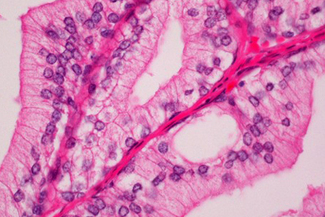 Classical histological stain for nucleic acids (blue) and proteins (pink). Featuring modified hematoxylin and Eosin for improved staining performance. Features: - Ready-to-Use - Stains Cytoplasm: Light Pink - Stains Erythrocytes: Pink/Red - Stains Collagen: Pink - Stains Nuclei: Blue - Stains Muscle: Pink/Rose - Suggested Control Tissues: Small intestine, Appendix, Colon, Prostate Components: - Hematoxylin, Mayer’s (Modified), 30 ml - Bluing Reagent, 30 ml - Eosin Y Solution (Modified), 30 ml Details: Intended for use in histology and cytology applications. Included in this kit is a modified Eosin that provides the benefits of a traditional alcoholic formulation with significant improvements in usability. Advantages include lower evaporation rate, better color patterns, and improved surface tension to remain on tissue section. Our Hematoxylin produces crisp, intense blue nuclei providing optimal contrast to the Eosin stained cytoplasm. Notes: a) Intensity should be optimized for each tissue type, fixative used, and presentation (frozen or paraffin-embedded) b) Use standard laboratory precautions to avoid contact with skin and eyes. c) Harmful if swallowed. Do not take internally. d) These reagents are for research use only. e) Follow all Federal, State and Local regulations for disposal. Prostate section stained with Hematoxylin & Eosin Stain Kit (cytoplasm, pink; nuclei, blue).